The heart of the ancient Inca Empire, mythical and vibrant Cusco is a city beyond imagination for even the most seasoned travellers. It stands to reason that Belmond Palacio Nazarenas should be equally individual and rich in history. Your ‘Once upon a time…’ journey starts here. WOULD THE NUNS in this converted 17th-century convent have approved of the pisco sour cocktail-making stations? Anything is possible, given the diverse incarnations of this contemporary urban retreat. Our acclaimed hotel was built on Inca foundations and became a palatial private home in the 1500s. It was owned by the conquistador Mancio Serra de Leguizamón—a warrior who is said to have gambled and lost the gold Inca image of the sun from the Coricancha temple. The Jesuits converted the building into a school in 1644, which itself became a convent in 1715. We’ve preserved all that’s most precious here: you’ll find original Inca stonework, colonial frescos and gold-framed paintings collected by the nuns. At the same time you’ll discover the best of the new world within our walls. From our cutting-edge contemporary Art Lima collection to our suites’ oxygen-enriched air-conditioning, underfloor heating and Bose sound systems. We’ll look after you in the most elegant way possible, whether your idea of relaxing is taking a morning yoga class or an evening salsa lesson. We believe that the small touches matter. Our guests can enjoy the services of our soap butler, who offers herbal baths, special pillows and soaps made with flowers from our garden. They’ll help you acclimatise to the altitude. Under the careful eye of chef Rodrigo, our restaurant Senzo uses vegetables grown at an organic farm in the Sacred Valley. 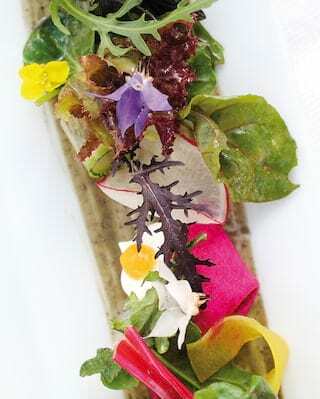 Many of our dishes feature indigenous herbs and are decorated with edible flowers grown from our own gardens. With Hypnôze Spa really does offer an experience like no other. Treatment rooms feature glass floors looking down to the beautifully preserved Inca foundations underneath. Breathe deeply in the world’s only fully oxygenated spa and relax with an aromatherapy massage. They use Andean herbs selected by a local shaman. Belmond Palacio Nazarenas is built around a cloistered courtyard. At the centre you’ll find a centuries-old octagonal stone fountain with Inca-style running water channels. There’s something supremely relaxing about the sight of our whitewashed Adobe walls and carved wooden balconies in the soft afternoon sun. 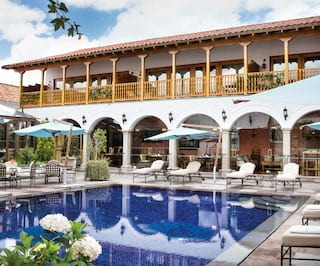 Stretch out on a sun-lounger by our pretty pool—Cusco’s first. Help yourself to fresh fruit and sunscreen under the wide blue sky. Life here really is sweet.